ST. LOUIS, Mo. – Guests and St. Louis neighbors can now enjoy the ultimate gingerbread experience with a multi-tiered holiday creation. 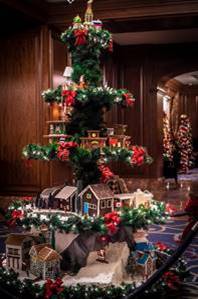 The Ritz-Carlton announced the unveiling of its life-sized gingerbread holiday tree on Wednesday. The multi-level “sugary sweet extravaganza” brings to life holiday traditions from around the world and members of the public can personalize their own gingerbread ornament to hang on the tree. The five-level tree has grown to reach the hotel’s lobby ceiling chandelier. 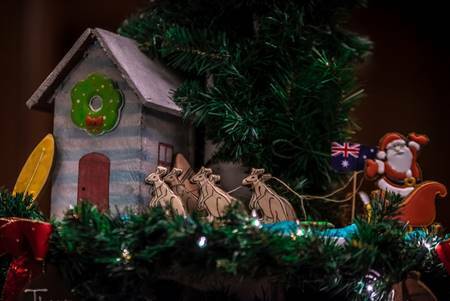 Showcasing gingerbread holiday scenes from the U.S., Canada, the Netherlands, Australia, Japan, Mexico, Russia, Switzerland, China and more, the multi-tiered tree has sugary highlights including kangaroos, pyramids, windmills and Santa Claus on a snowboard. According to The Ritz-Carlton, the creation was concocted with 75 pounds of flour, 100 eggs, 50 pounds of powdered sugar, 25 pounds of butter, 15 pounds of egg whites, 10 pounds of molasses and three pounds each of ginger and cinnamon. Everyone is encouraged to enjoy the gingerbread tree in person, which will be available for viewing until Dec. 29th. The hotel also invites individuals to personalize a gingerbread ornament in honor of a loved one for personalization cost of $15. Each ornament will be hand-applied to a colorful garland which will circle the tree throughout the month of Dec. All proceeds from the ornaments will be donated to the City of St. Louis’ Ronald McDonald House. Those wishing to enjoy a dining celebration at The Ritz-Carlton, St. Louis, may do so. The hotel currently has availability for its Christmas Eve and Christmas Day Dinners in The Grill, both dinners will feature four special holiday courses. Reservations for dining are required. To reserve a table call 314-719-1433. The hotel will also celebrate the holidays with special new seasonal spa treatments at its Fitness Center and Spa, and Ritz-Carlton gift cards may also be purchased in time for holiday giving.